5. Joan of Arc is also said to have had schizophrenia, not just epilepsy. But that still didn’t stop Jeanne d’Arc from helping the French beat the English. 8. An EEG isn’t just used with epilepsy, it’s used to check for problems with loss of consciousness or dementia and find out about a person’s chance for recovery after a loss of consciousness. It’s also used to find out if a person in a coma is brain dead. 10. Because epilepsy affects the brain, a lot of people are scared to talk about it. But there’s a common saying among those with epilepsy “It takes a brain to have epilepsy”. Newton had a brain and he had epilepsy; he fits the bill. 12. A lot of patients with epilepsy go through this scan to confirm that they’re diagnosed with epilepsy and to check if they’re eligible for brain surgery. It involves going through a tube and hearing loud noise. People with cancer and other diseases/disorders often go through this scan too. It uses magnets so you have to take off all your metal jewellery and other metal objects before going in. If you have metal objects inside your body before going into one you have to tell your doctor/technician because the “Magnetic Resonance Imaging” (MRI) might move it. 14. A neurologist knows a lot about the nervous system and the disorders affecting it, but after being diagnosed with epilepsy, you see an epileptologist, a neurologist who specializes in epilepsy. This doctor is the one who diagnoses medication and takes care of testing. 1. Some people aren’t able to control their seizures using just medication or medicinal marijuana. So they resort to brain surgery to treat their seizures. For some, surgery may be taking out a tumor or a lump in their head, but for others it may be taking out a piece of the brain. But today the means of treating epilepsy are growing. There are pace-maker like chips that can be implanted into the skull, and other electronic devices in development that have been found to ward off seizures. 2. Epilepsy organizations work hard year-round to raise awareness about epilepsy, but Purple Day (March 26) is when everyone is encouraged to wear Purple, the colour of epilepsy and work together to raise awareness and end the stigma around it. 3. If you see someone having a Petit Mal seizure, going through something that doesn’t look right, the best thing you can do to help them is doing the same thing as someone with a complex partial seizure: give them room, don’t restrict them, watch them, and stay nearby in case they lose consciousness, injure themselves or a paramedic needs to be called. One type of Petit Mal is an absence seizure, when a person looks completely phased out and has no idea what’s happening. 4. Laser surgery might be in Europe right now, but it might come to Canada soon too since it’s in America. 7. Some people with epilepsy are lucky – they go six months without a seizure and then they can drive. But others aren’t as lucky. They have to rely on taxis and public transit for their entire life. In Brampton and Mississauga someone who’s blind rides free; but in Hamilton, Toronto, and Ottawa, all adults, whether they can or can’t see, pay regular fare. 9. Vincent Van Gogh took his own life, but after a short time there were memorial shows of his work. 10. At the age of six, Ludwig van Beethoven, on March 26, 1778 (what’s Purple Day today), performed his first public recital, arranged by his father. In 1781 he said “Music comes to me more readily than words”. He died on March 26, 1827 but not before he left the world works that are still listened to today. 13. This scan, a Computed Tomography (CT) or Computer Axial Tomography (CAT) is also used in the epilepsy diagnosis process and surgery testing process. The difference between the process of a Computed Tomography scan and a Magnetic Resonance Imaging scan is that in a Computed Tomography, you’re going through a donut shaped instrument, but in a Magnetic Resonance Imaging you’re in a tube. 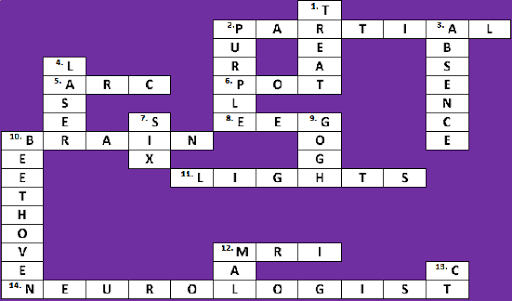 This entry was posted in Crosswords, Epilepsy and tagged Absence, Canada, Electroencephalography, Epilepsy, Health, Purple Day, Seizure, Society by Rahman. Bookmark the permalink.